Last weekend, the weather was so clear, sunny and frosty that I knew I wanted to spend it outside so we could make the most of it. 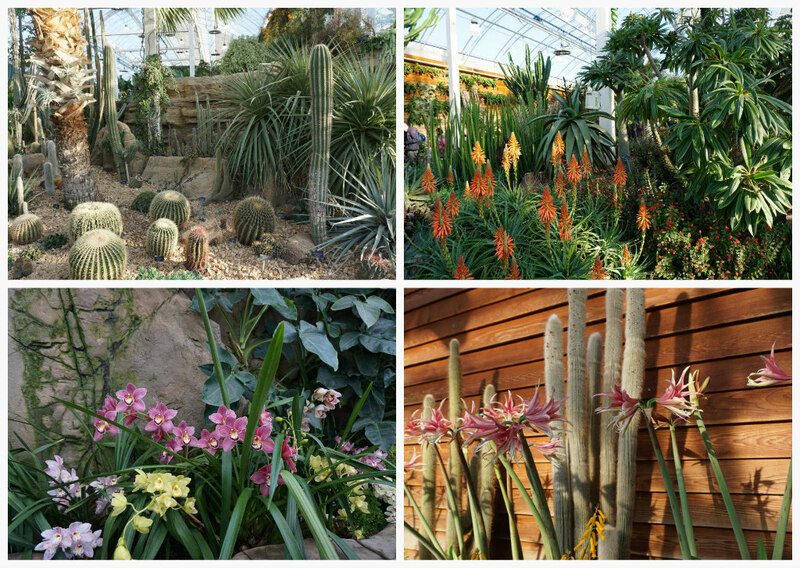 So we wrapped up warm, and headed down the A3 to visit Wisley, the Royal Horticultural Garden in Surrey. 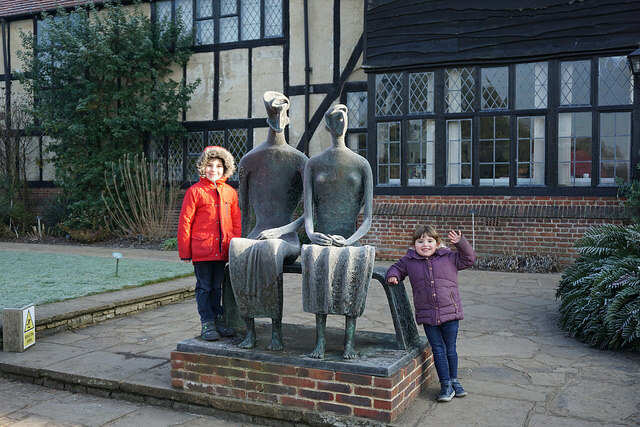 We started our visit by exploring the formal gardens near the entrance and immediately fell in love with the Henry Moore ‘King and Queen’ sculpture! 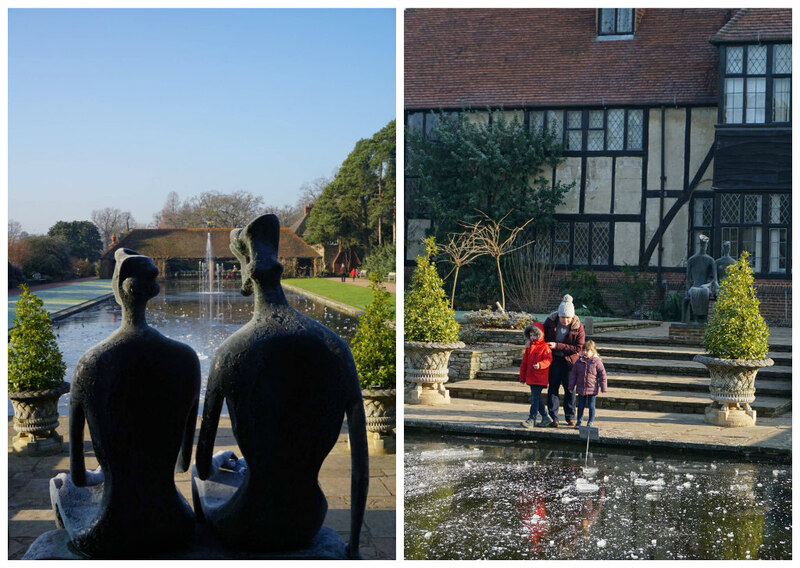 They look so peaceful staring out at the water and gardens! Unlike my children who were so excited to see lots of ice on the water! 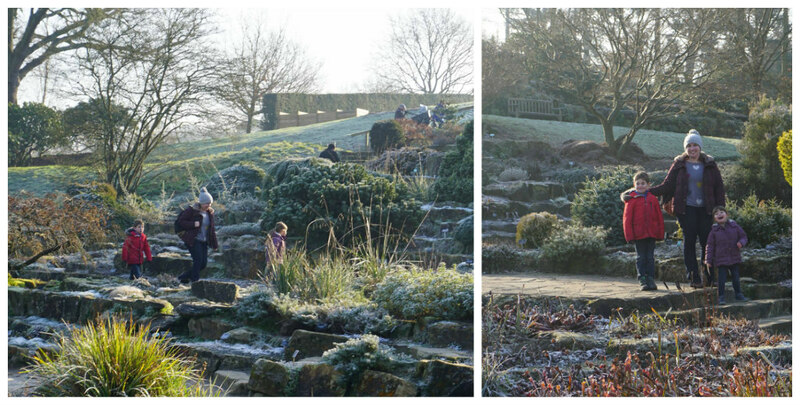 It was absolutely freezing which made the rock garden look so mysterious and atmospheric. We explored the little paths for ages. Everything was covered with frost, but still so many different colours came out from the planting. I loved all the little paths that criss-crossed the gardens. It was a busy Sunday with lots of families visiting, but it was easy to find a quiet spot by just following a different path or bridge. 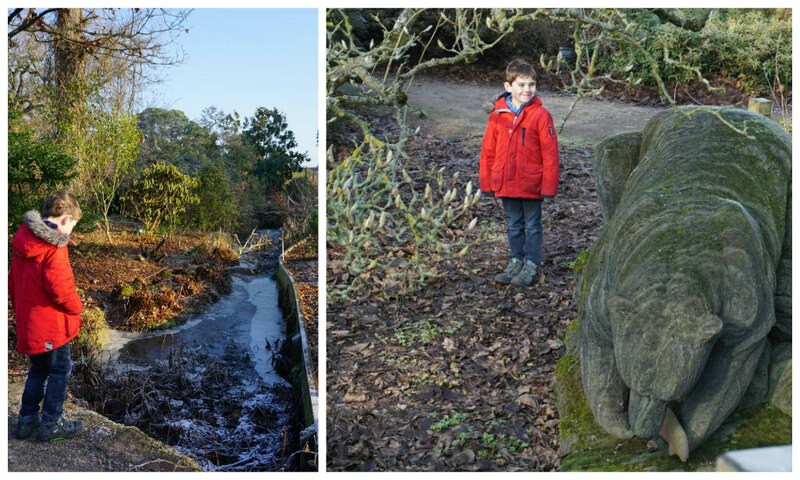 Alex liked spotting statues like this bear with a fish by the icy canal. 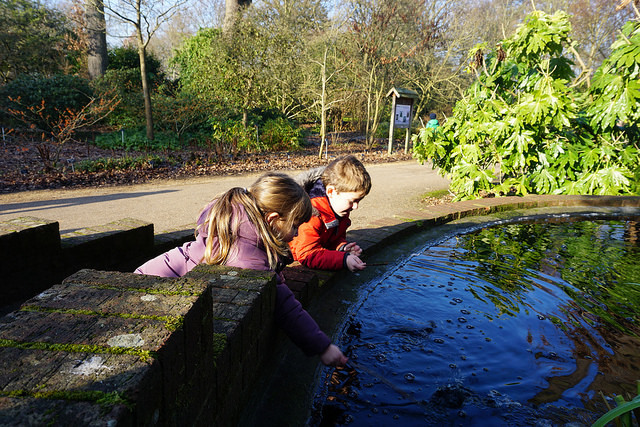 Not all the water was entirely frozen, so the children took the opportunity to get a little bit wet, and feel the small sheets of ice that were floating on the surface. One of my favourite things about the gardens were the sculptures that were all over the gardens. They were beautiful (and loads of them were for sale which was very tempting indeed!). Sophie liked these flowers which had tiny butterflies and caterpillars on them if you looked closely. She also loved the big green caterpillar near the entrance, and I loved the rainbow butterflies and the beautiful roses. 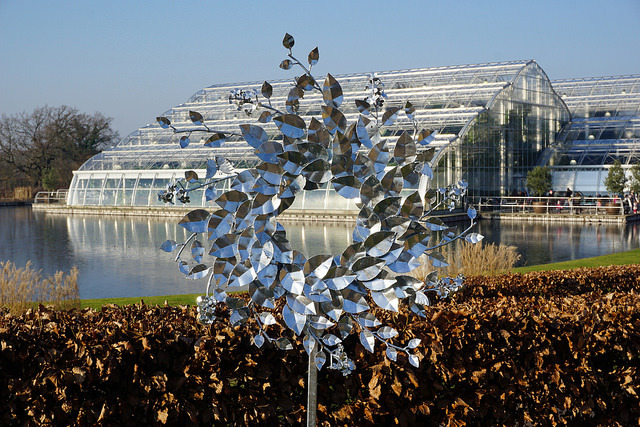 And this glorious wreath directed us to the glasshouse – and the promise of some warmth! What a contrast inside! 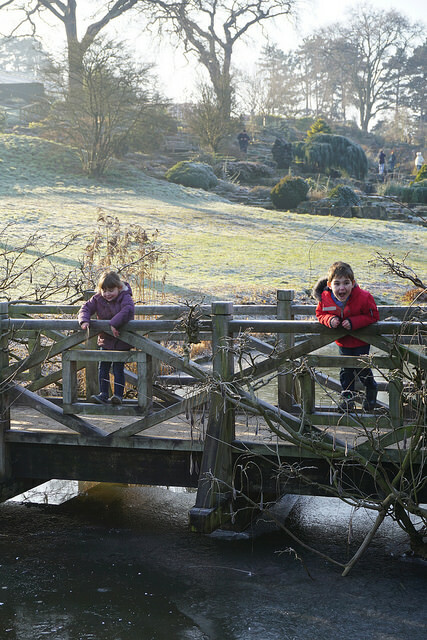 We stripped off our coats and jumpers and loved the sensation of heat and colour. 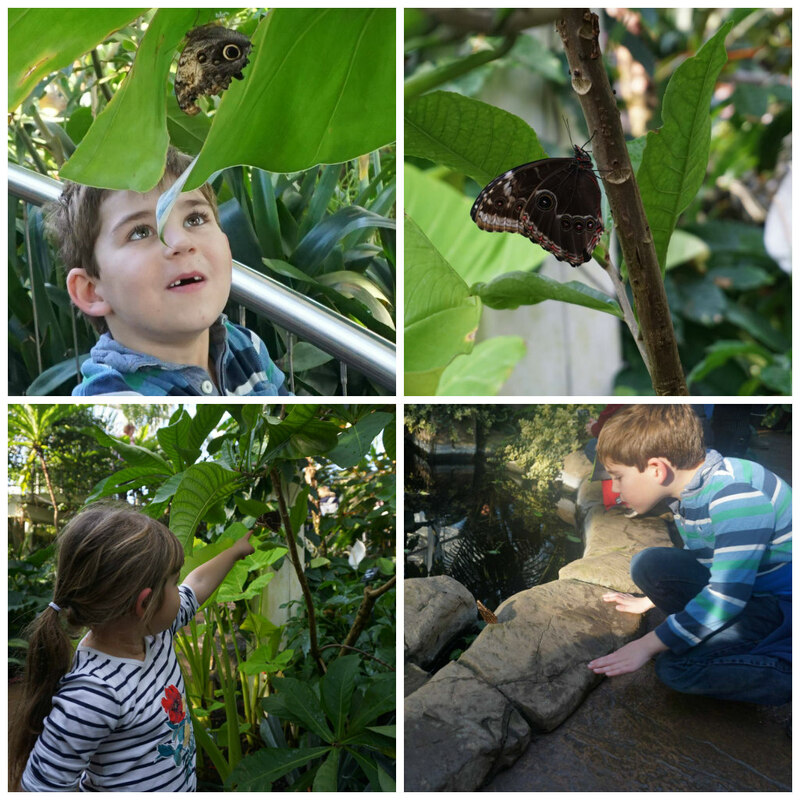 We were excited about seeing the butterflies which are on display in the Glasshouse until March. 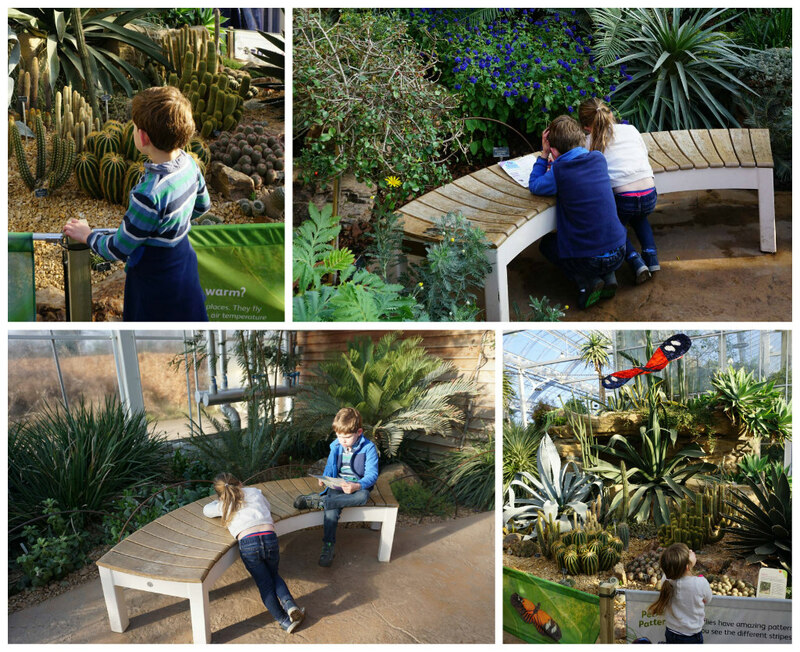 We joined the long, but fast moving queue to see them while the children moved from bench to bench completing the Wisley activity sheet and looking at the prickly cacti! It was worth the wait – it was such a treat to be surrounded by more than 50 species of butterfly. 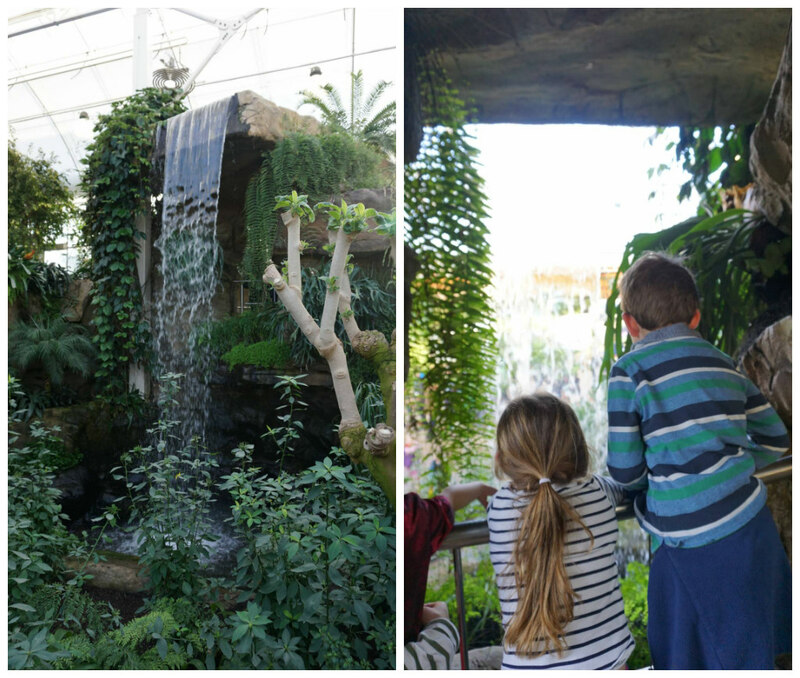 Apparently there are more than 6,000 in the Glasshouse! The children adored it and loved spotting the different colours and shapes. 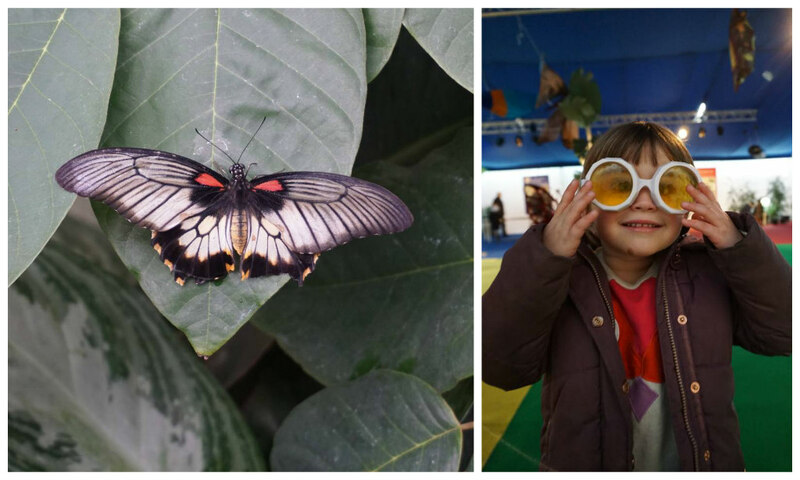 After walking through the butterflies, we popped into the small exhibition where we learned more about butterflies – here’s Sophie wearing special glasses that help her see like one! 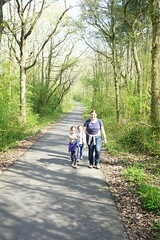 When we dragged them away, we enjoyed one more wander around the warm space. Alex and Sophie were particularly thrilled to walk behind the waterfall together! 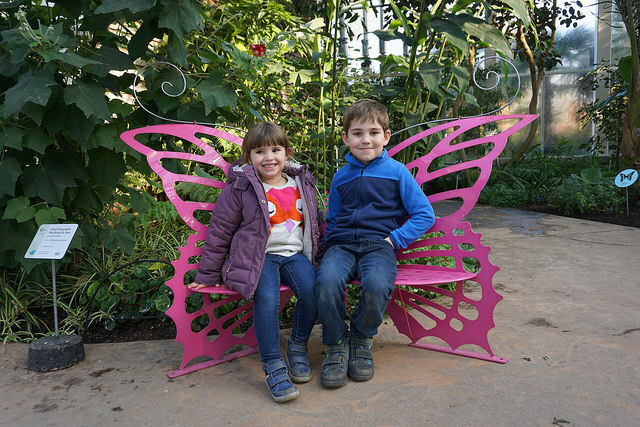 And Sophie was desperate to take this glorious pink butterfly home! Eventually, we braved the chilly weather again. 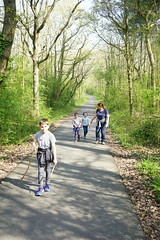 After a delicious lunch in the Glasshouse cafe, we headed back following different paths. 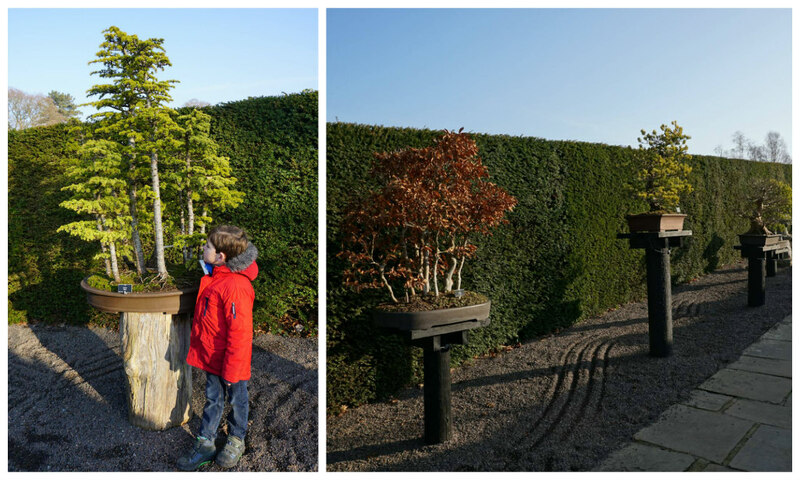 We were surprised to find a whole path bordered by amazing bonsai trees, some of which were over 75 years old! Alex was so interested in them – he’d never seen anything like it! We spent hours exploring, and only saw a small portion of the gardens. 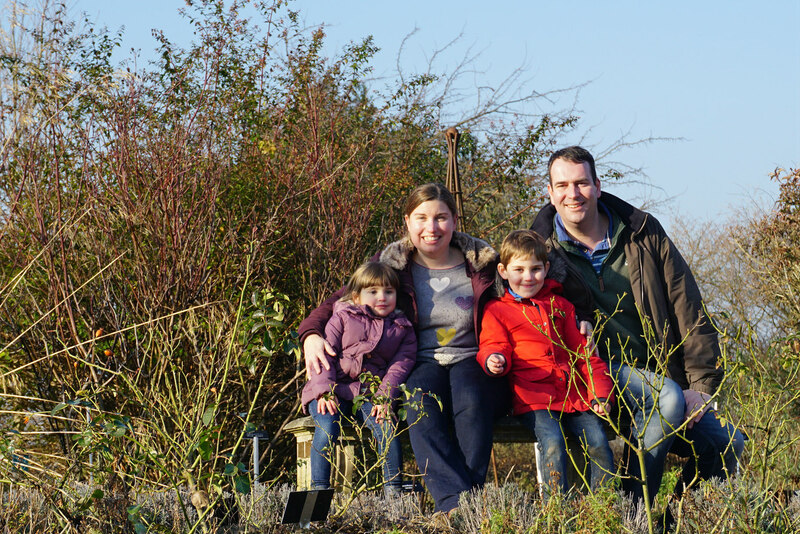 We loved it so much, we bought annual membership which was really good value – and are determined to come back to see how the gardens change through the seasons. Yay to annual membership, you’ll have to make the most of that now, mind you it looks like it won’t be too hard. 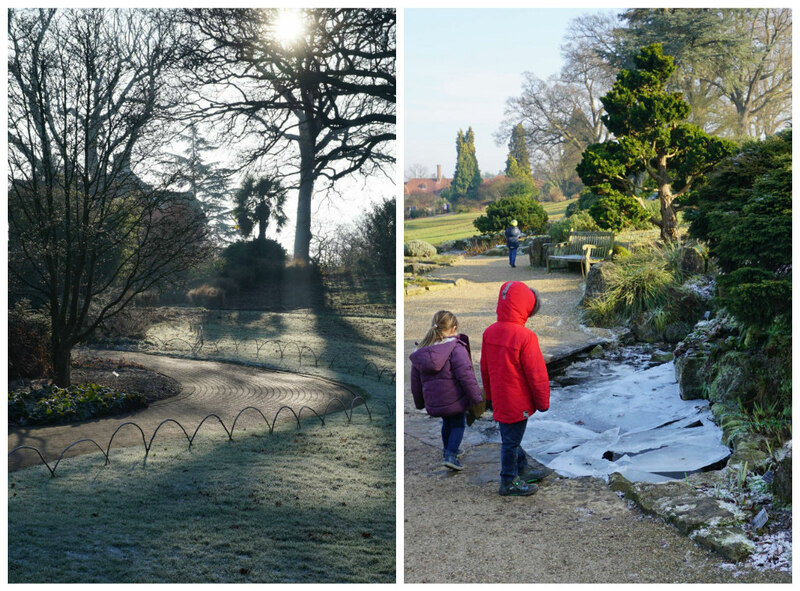 It must have been lovely to go indoors to see the butterflies after being out in the cold, but what gorgeous photos that frost gave you. I’d like some of those flower sculptures with the butterflies inside for my fairy gardens, I shall be on the look out now!